A stale family hostage drama, Trespass is a brain-dead exercise in rehashing old ideas with a large dose of ineptitude. 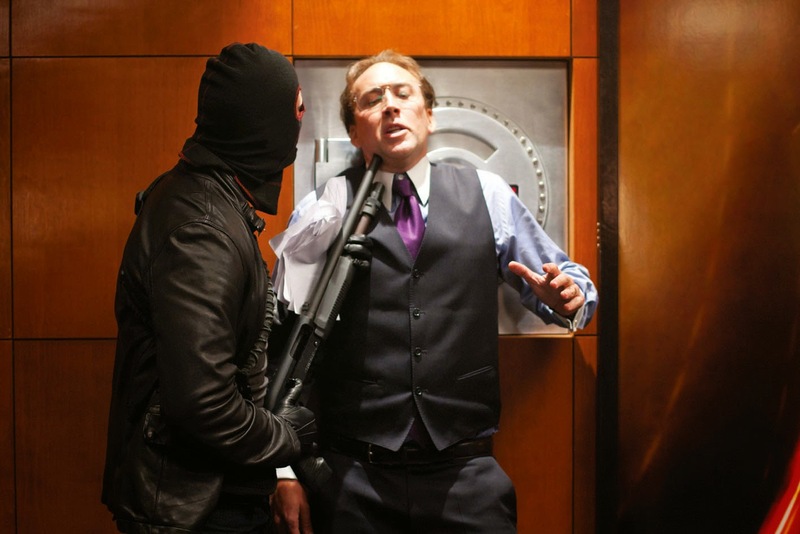 Kyle Miller (Nicolas Cage) is self-employed as an independent middle-man in the diamond trade business, operating in the more shadowy corners of the industry. He lives in a large custom-designed house, but his marriage to Sarah (Nicole Kidman) is dying due to lack of attention. Their teenaged daughter Avery (Liana Liberato) is fully into the rebellion stage. One dark night, with Avery having sneaked out of the house to attend a house party, the Millers are invaded by a noisy armed gang consisting of leader Elias (Ben Mendelsohn), his brother Jonah (Cam Gigandet), Elias' girlfriend Petal (Jordana Spiro) and the brutish Ty (Dash Mihok). Elias demands that Kyle hand over the diamonds stashed in his safe. Kyle refuses and starts stalling, allowing for cracks to emerge among the home invaders. And it soon becomes apparent that Jonah was the technician who installed the Millers' complex alarm system, and his hunky wiring work may have attracted the roving eye of the lonely Sarah. Trespass invests 10 minutes in establishing the Miller family dynamic, the next 10 minutes firing the opening salvo of the home invasion, and then disintegrates into nonsense. The script by Karl Gajdusek has a torrid time trying to extend the drama to 90 minutes, and most of the movie consists of angry people screaming loudly while pointing guns at the heads of scared victims. On numerous occasions the guns change hands, and the Millers have many opportunities to run and call for help, but of course the film always contrives a way to prolong the hostage agony for another round of hissing, cussing and shouting. Director Joel Schumacher, working hard to erase memories of his better films, never comes close to creating any sort of tension or excitement. The home invaders soon turn into a band of dysfunctional idiots, with internal arguments, drug addictions, botched previous jobs, jealousies and double-crosses all coming to the fore. Jonah's infatuation with Sarah places him on the wrong team and at odds with his brother, adding to the loud arguments erupting throughout the Miller household. Nicolas Cage and Nicole Kidman embarrass themselves with this schlock, both mailing in routine wide-eyed victim roles. It is left to youngster Liana Liberato to deliver the most engaging performance as the pouty and headstrong Avery. Trespass crosses all the wrong lines, heading in a misguided direction.